I hate being late for meetings that’s why I like to show up early. Despite my efforts it’s rare that meetings start on time. Traditional visitor sign in is time consuming and a hassle. Besides, does anyone ever really read or track all those visitors log sign-sheets? This is why I am excited to tell you about a new Visitor Management Software called MyLobby. Visitor sign in sheets or books are not confidential. After several attempts the receptionist escalates this and either; calls another colleague to help find the host of the meeting or begrudgingly puts a universal page over the PA system for the staff member to come to the front reception to meet their visitor in the lobby. Unfortunately, many of us have experienced this scenario on too many occasions. Once the host and visitor finally greet in the lobby, they’re usually exchanging apologies. I usually start by saying, “I’m sorry I arrived well before our meeting to get registered”. And usually, my host apologizes for not being where they could be reached. This is usually embarrassing and challenging for both parties. Once we reach the boardroom, and go through the introductions almost 20 minutes past our original meeting time. Now we can finally get down to business, the challenge is your one hour meeting that you’ve planned for, is now reduced to less than 30 minutes due to the lost time. Here is the big question, how much time is wasted in productivity with the whole traditional visitor process? On average the estimate per meeting is 15 to 20 minutes of unproductive time for the host organization. It’s not just sales people; this is a challenge for other types of visitor and for employees from other locations, consultants and hired contractors. Four executives waiting their meeting to start 15 min x 4 = 1 hour . 3 meeting per day 3 hours x 5 days per week = 15 hours per week wasted. As you can see this is a modest calculation and can be easily be doubled to 30 hours per week for most organization with multiple meeting rooms. Although, I think you guys get the picture. 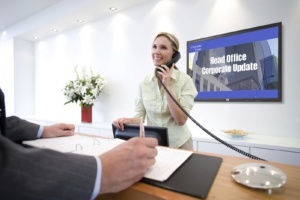 Visit My-Lobby.com and reclaim your productivity with this new Visitor Management Software. 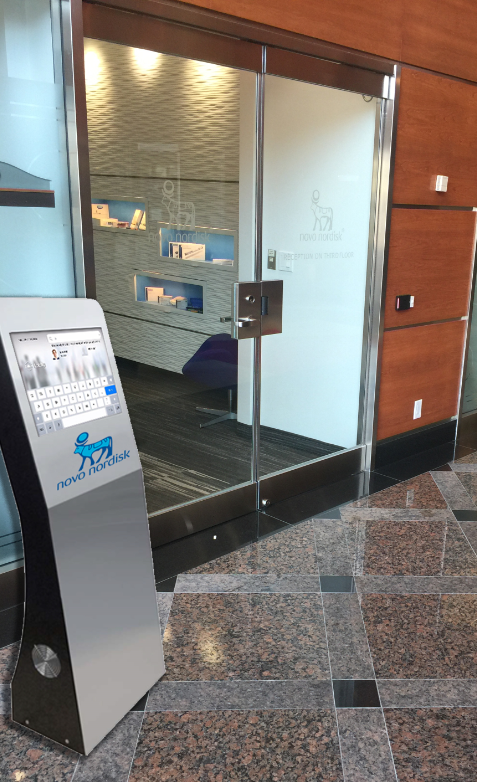 This is Visitor Management Software that sits on the counter or standalone kiosk. As soon as the visitor signs in on the tablet it sends an instant email and a text message notification to the host. We want to hear from you. Tell us about your Lobby stories and we welcome suggestions, because as a software developer, we’re always looking for opportunities to improve communication. We are a full service agency that delivers compelling digital marketing solutions. Our winning solutions and experience helps to deliver great results across several key areas. Every call and inquiry is our top priority. This is so true. Our visitors are always taking too much time to getting registered at the front desk.This an awesome solution !!!! Copyright (c) 2015 All rights reserved MyMedia Inc.